RALEIGH — Although they would never admit it, the men who started a mobile home park in Southeast Raleigh have a bit of Santa in them. On Saturday, they once again provided a Christmas experience, complete with gifts, that their tenants might not have otherwise. into a mobile home community in 1998. Parrish Manor, located off Jones Sausage Road near Garner, stands out from other low-income housing for its sense of community. “What Parrish does is housing, but what families need is programs to help their kids develop,” Courtney Crowder said. He’s a board member for the Nessie Foundation, the nonprofit arm of Parrish Manor, started in 2006. The Nessie Foundation works with nonprofit groups to connect residents to after-school programs, sports, gardening, cooking lessons, food assistance and Christmas presents. When asked, “Why?” the younger Parrish grinned and repeated the question. “We just saw a need and started it.” No big deal. That’s the humble manner he uses to describe the way the visionary, award-winning mobile home park came about, too. On Saturday, more than 100 families in the neighborhood came out to enjoy a puppet show, be photographed with Santa and celebrate Jesus’ birth with cupcakes. “It is wonderful what they offer,” said Virginia Scott, as she waited with her four young kids to see Santa. Her family relies on the food assistance, and her kids do gardening and participate in the Boys and Girls Club. “I wish there were even more programs,” Scott said. Child Evangelism Fellowship, a national interdenominational nonprofit organization, brought a truck full of brand-new items donated by local churches. 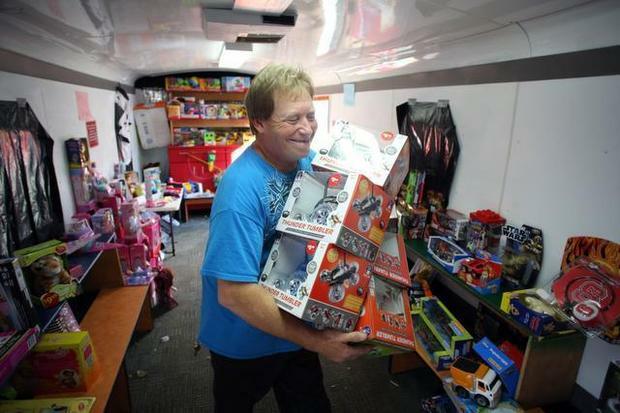 Bob Fowler is the director of Child Evangelism Fellowship for the Greater Raleigh area and another plainclothes Santa. Since Dec. 1, he’s been in a different neighborhood every night, delivering gifts and sharing a message of the real reason for the season. Parents got to go shopping for what they thought each child would like from the truck of toys and take it home to wrap it themselves. “We do it so it’s still the parent looking after their child and getting to give them a Christmas present,” Fowler said. Each child will receive at least two gifts, some of which may be their main gifts. The giving spirit isn’t only around during the holidays. children there receive free or reduced cost lunch. There’s a bus that drives kids from the neighborhood to the Boys and Girls club. And a soccer field where kids can play with the Capital Area Soccer League. As of the fall, Interfaith Food Shuttle began helping residents build there own gardens in their yard. “It would be a great thing if this was replicated in other communities,” Crowder said.